This week, chimeric antigen receptor (CAR) T cells that simultaneously target multiple antigens within the heterogeneous cellular milieu of glioblastoma tumors have been shown to mitigate tumor escape and improve survival. Targeting a tumor-specific profile rather than a single cancer-specific marker could result in better therapeutic efficacy. Even when they are composed of the same types of cells, tumors located in different regions of a person’s body can behave differently owing to differences in the tumor microenvironment, such as neighboring cells that suppress/dampen the immune response. Additionally, the cells within a single tumor can display considerable heterogeneity due to mutations. It is becoming increasingly clear that these heterogeneities are one of the reasons that chemo- and immunotherapies sometimes lead to an incomplete response: while cells amenable to the treatment are initially killed off, the refractory cells continue to propagate – leading to the phenomenon known as antigen/tumor escape. 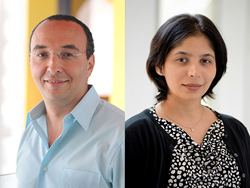 Nabil Ahmed and Meenakshi Hegde, professors of pediatrics at Baylor College of Medicine, are utilizing CAR-T cells to mount a specific and targeted immune response against glioblastoma. Specifically, they have been interested in the fact that when CAR-T cells are engineered to target a single glioblastoma-specific antigen they can induce robust tumor shrinkage initially but eventually still give way to antigen/tumor escape in 40-60% of animals tested. They reasoned that engineering CAR-T cells to simultaneously attack multiple tumor-specific antigens would effectively cast a broader net around the tumor – minimizing the number of cancer cells that go undetected, mitigating tumor escape, and improving survival. View Ahmed and Hegde’s complete paper here. Learn more about xCELLigence RTCA, and how it is being used for cancer immunotherapy research. Founded in 2002, ACEA Biosciences is a pioneer in the development and commercialization of high performance, cutting edge cell analysis platforms for life science research. ACEA’s xCELLigence® impedance-based, label-free, real-time cell analysis instruments and NovoCyte® flow cytometer are used in pre-clinical drug discovery and development, toxicology, safety pharmacology, and basic academic research. More than 2,000 instruments have been placed globally, leading to >1,200 peer reviewed publications. For more information visit http://www.aceabio.com.